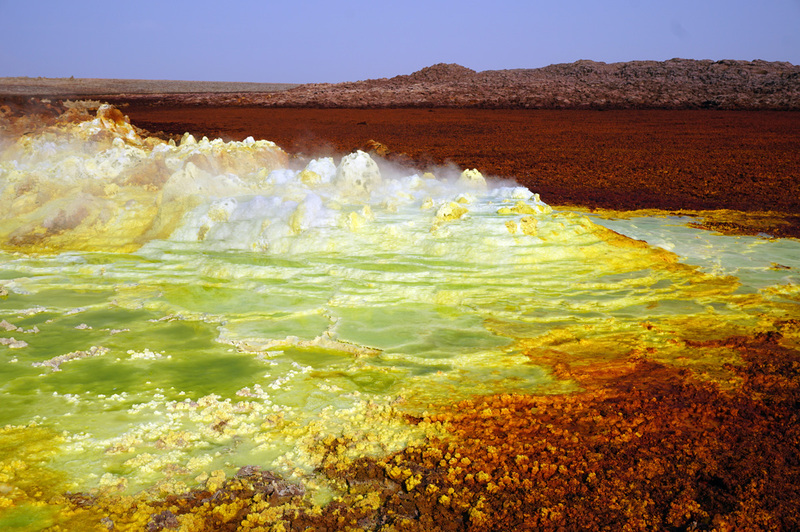 Ethiopia’s Dallol region combines a salt flat with volcanic hot springs, to wildly colorful effect. Hot rocks far below are forcing up hot salty water, laden with minerals. The bubbling hot springs then form brightly colored salt formations and salty lakes. The active areas are continually changing, with new features appearing and old ones drying up and fading. The currently active hot spring area is full of lots of little bubblers, 1-3 inches, burbling up colors. The water is hot, but not boiling – most of the bubbles are trapped gas, not steam. There is yellow from sulfur, green from potash, red from iron, white from pure salt. The colors are much more intense than anything I remember from Yellowstone. They look ridiculously over-saturated! I suspect this is because I’m seeing colored salt, whereas at Yellowstone you see colored limestone. When there is rain (which happens every few years) all the formation and colors are washed away. The Danakil depression in Eastern Ethiopia is one of the lowest and hottest points in all of Africa. 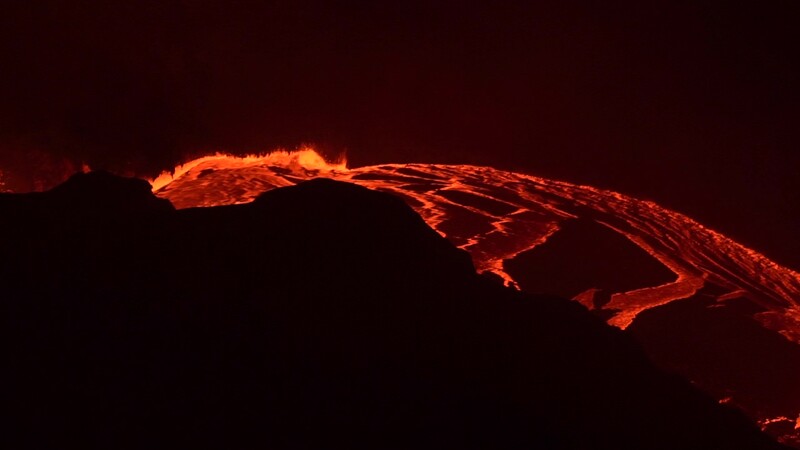 It’s at -127 meters and is dry, HOT, and salty. For centuries, the locals have mined the hot salt flats and exported blocks of salt to the farmers in the cool, green, Ethiopian highlands. They still do it as they always have, entirely by hand. The salt blocks are cut out with wedges and axes and then finished with hand chisels. 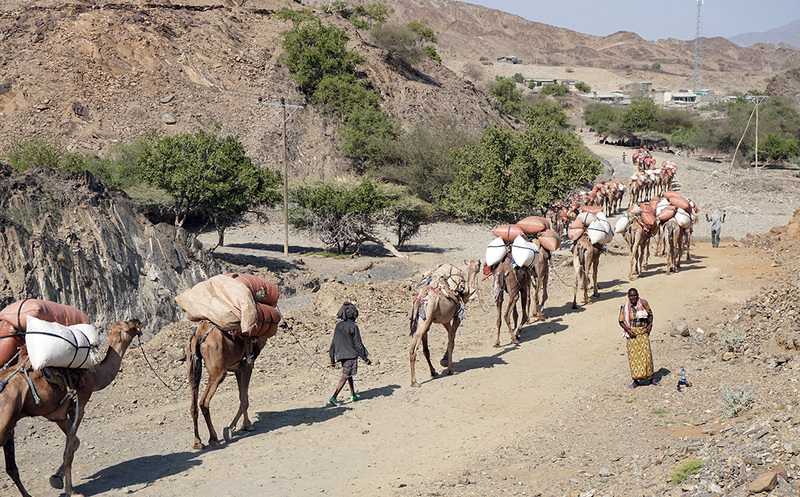 They are loaded onto camel caravans and shipped off to the farmers. The miners work 8 hours a day, 6 days a week, 10 months a year. Did I mention it was hot? The camels can survive the ten day round trip without water, but they need fodder. So they wisely bring giant bales of hay down from the highlands and stage half of it along the way, to eat on the return journey. 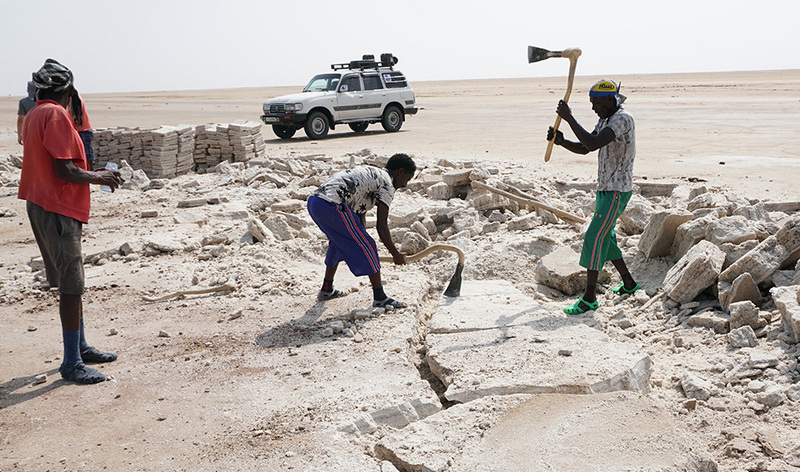 The 5kg salt blocks sell for 5 Birr (20 cents) in Danikil and 25 Birr ($1) in the highlands. 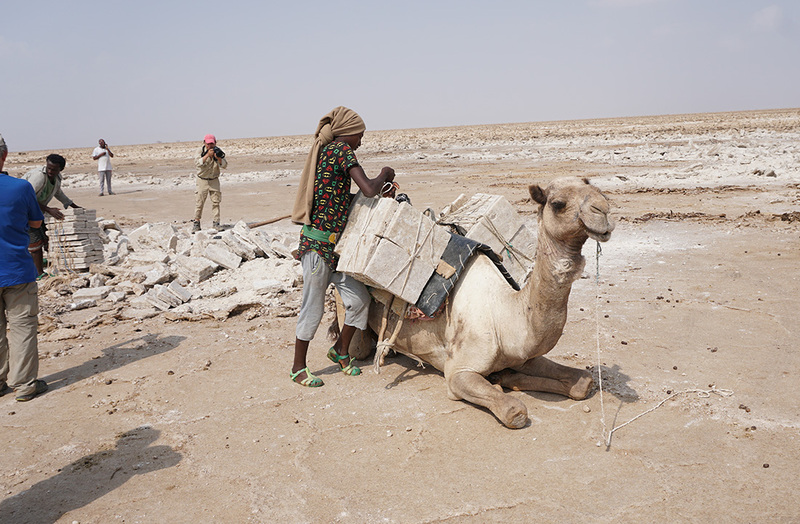 There was an attempt to use trucks to move the salt, but the local leaders in the Danikil blocked it, as they think their community makes more money servicing the camel caravans. Seeing the miners at work and the camel caravans was extremely striking. This felt like an unexpected glimpse into a very different world. Camels coming down from the highlands, carrying hay. 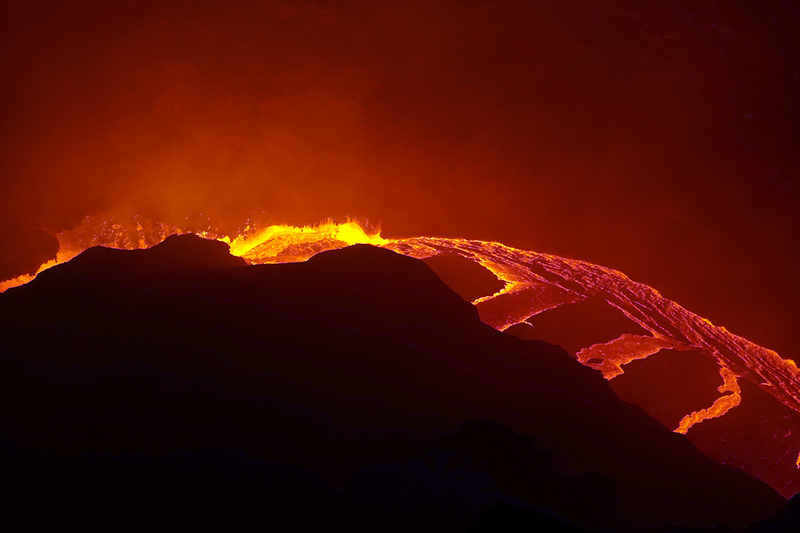 I trekked up Ethiopia’s Erte Ale volcano to admire its fine lava. Formerly there was a lava lake at the summit, but this was disrupted in the January 2017 eruption and the lake drained away. 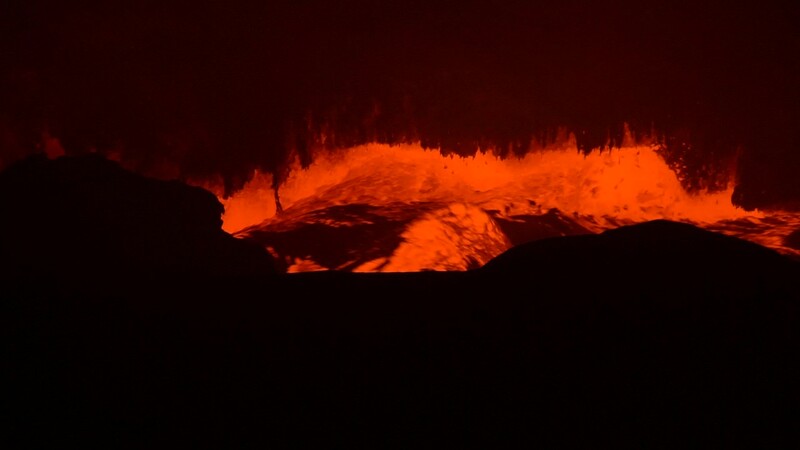 However, it has been replaced by a fresh flow of lava being forced up from below. 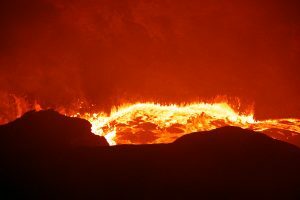 This lava flows across the crater and then plunges down into a subterranean passage, most likely heading down to the new lower crater. 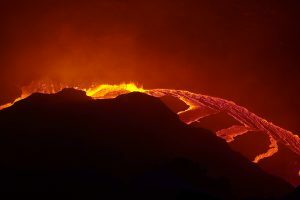 The lava definitely isn’t “oozing” – it is flowing rapidly like water, with maybe 5 – 10 meters/second flow, with stripes of grey mixing with bright red on the surface and with turbulent eddying, splashing and sloshing at the exit. 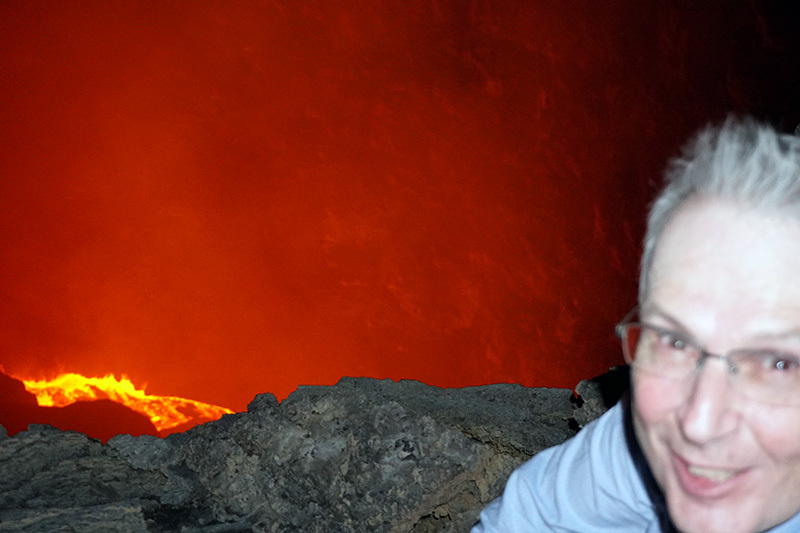 You get to see the flow through a wide fissure near the floor of the crater, perhaps 50 to 100 meters below. There is a good clear view and it is quite remarkably good fun to sit and watch. It was really fun to sit and watch! 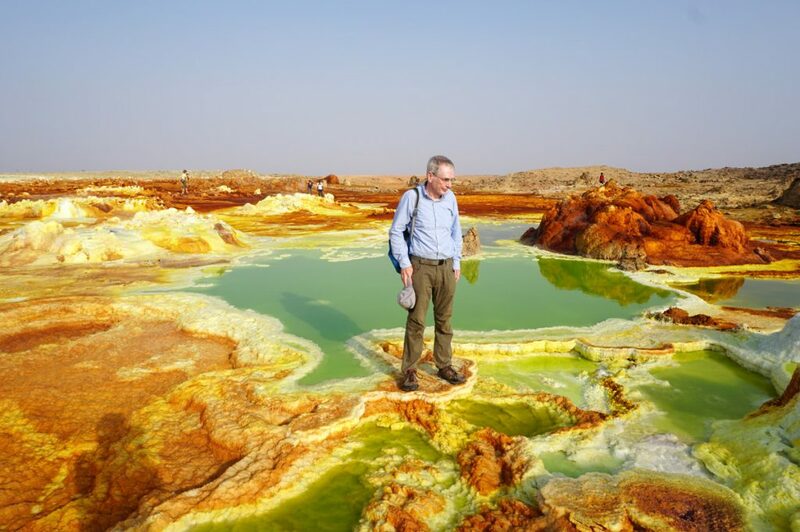 I visited on a private tour with Magma Flow Tours who did a really great job of looking after me and guiding me around both Erte Ale and the Danakil. I strongly recommend them! 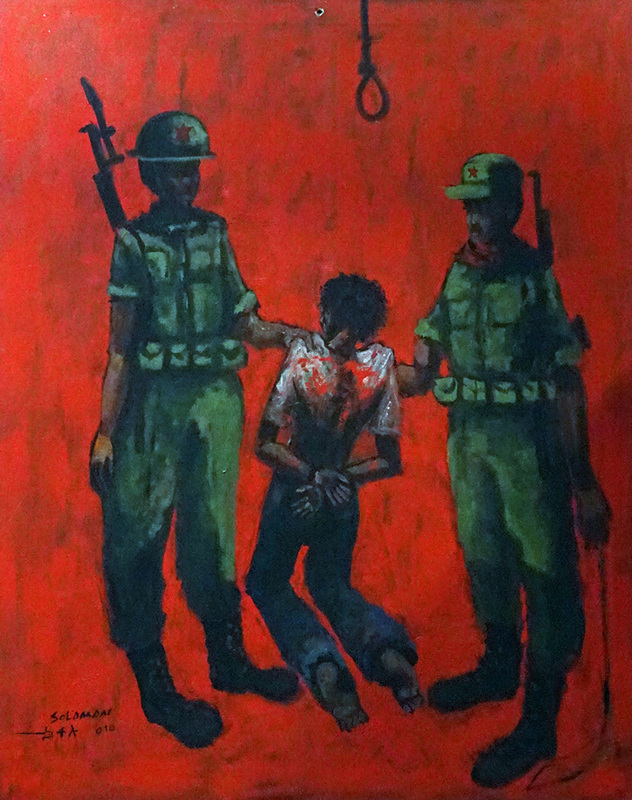 From 1974 to 1987, Ethiopia was ruled by a ruthless Marxist-Leninist regime known as the “Derg”. They renamed themselves in 1987, but were only finally overthrown in 1991. There are still odd traces of them in Addis Ababa. The statue of Lenin is long gone, toppled in 1991. 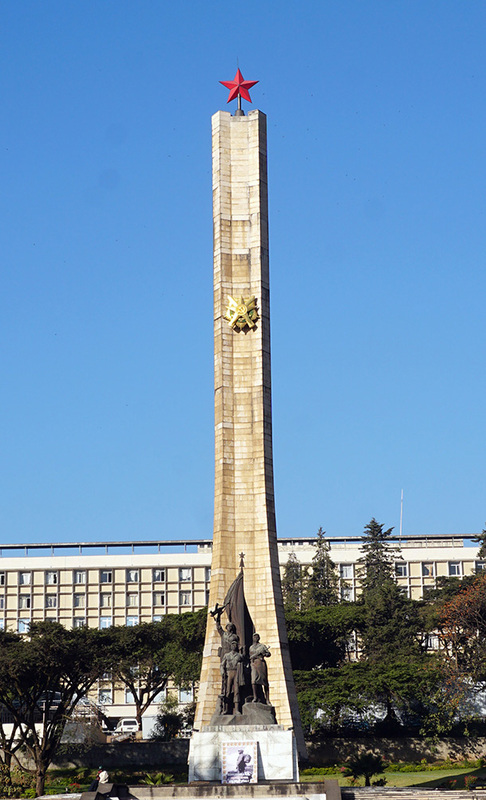 But a striking Soviet-style obelisk, known informally as the Derg Monument, still survives. It towers 50 meters tall, decorated with a hammer and sickle, and topped by a giant Red Star. It’s quite impressive. At the moment it is augmented by some placards mourning the death of Fidel Castro. 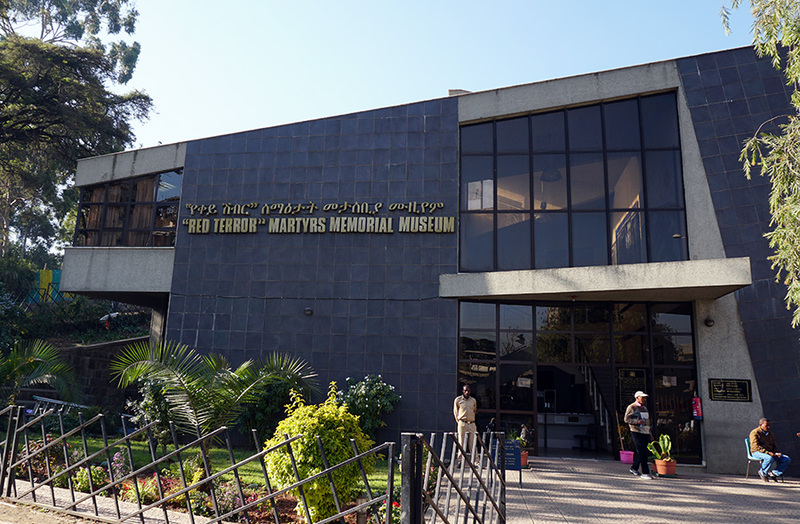 A few hundred meters away is the other side of the story, the Red Terror Martyrs Memorial Museum, which commemorates the several hundred thousand victims of the “Red Terror”, a lethal rampage primarily aimed at rival Marxist-Leninist groups. It’s a good small museum, outlining the rise of the Derg and then the horrors of the Red Terror itself.